Where is the photograph you used for Shawyer's demonstrator drive? Checked is number of all the combinations, Validated is number of formulas that respect dimensional consistency for kg m s units. Mean and standard deviation thresholds are lowered to yield approximately same number of selected formulas as previous run with all seven data points. This is quite good except Shawyer's results : should we skip those two outliers ? Rodal you are right that Q is more significant without Brady b : the Qless F = 13100 P/c (a-b)^2/(ab) no longer appears easily when relaxing mean constraint up to 12 (fudge factor in 163000 and 1/163000). is to be found amongst 200 formulas of similar or better levels of deviation. It is not robust. But I still like it ! I don't know. I speculate that knowing the big diameter, we might be able to back the small diameter out of Shawyer's performance model using his published data. He does say that the thrust agrees with his performance model and it does use diameters of the ends of the cavity. What statistical argument can you use to state that those two are outliers? Don't know if it's been mentioned, but the demo unit has a tuning plunger in the straight section. You can see the motor and drive gears etc hanging out on the rear. It was a sarcastical argument, not a statistical argument. I'm not seriously considering to lower the data count to 4 samples. You can use the whole data (including the outlier) if you like to make the argument. For the photon rocket argument I don't understand how the photons get out of the EM Drive and how does it get to do better than a perfect photon rocket. Can you make an experimental artifact argument? But seriously, that Brady (b) is a statistical outlier on the basis of its deviation from the statistical cluster formed by the data without it. Do you agree that there is a cylindrical section to Shawyer's Demonstrator EM Drive that has the same diameter throughout? and that the diameter of this cylindrical section is the same as the diameter of the small base of the truncated cone? And therefore the smaller diameter at the end of the cavity is the same as the diameter of the small base of the truncated cone? If my logic above is not faulty, then our large discrepancy (a factor 2 between us ) is a matter of measurement and scaling. this problem is considered in the last section." case for a static electric field outside its sources, because the difference of sign would not allow real solutions. gravitational effects, while non-stationary electromagnetic fields do. " If my logic above is not faulty, then our large discrepancy (a factor 2 between us and a factor of 4 between my estimate and McCulloch's estimate) is a matter of measurement and scaling. Of the photograph you and I are using is not the Demonstrator Drive, and Prof. McCulloch has better information as to what the dimensions of the Demonstrator Drive are? I don't know. I did post asking Prof M if he had better information. I also emailed Shawyer and Juan's university asking the same question. We will see if anyone responds. I had assumed that the tapered cavity extended within the cylindrical section but you may be right. 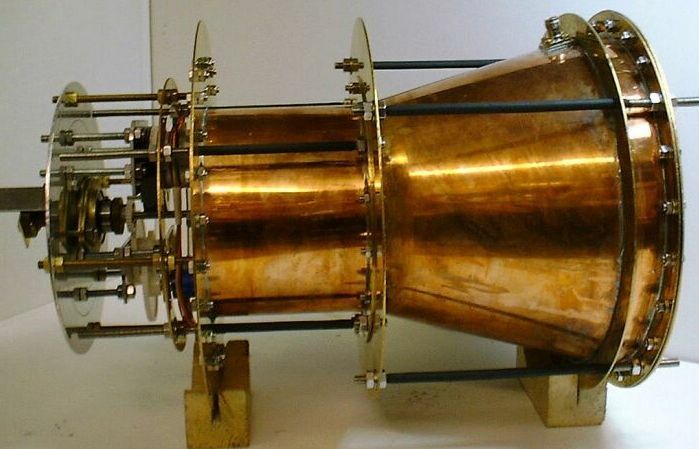 However, as was pointed out by Notsosureofit, it looks like there is some sort of mechanism in the cylindrical section. If there is a moveable small end, then I can't guess what the interior of the cylinder looks like. The upper gizmo is the motor and at the bottom it's driving a variable resistor as position feedback. It probably was fed w/ a fixed frequency generator. Hanging out the back is prob a limit switch. Prof. McCulloch has answered that "I think I estimated 4cm using the design factor, probably wrongly. Your photographic method is better"
15.3 cm using the RF connector, but not sure of the right connector and worse camera angle, sooo ? Can you also please estimate the OD of the big diameter base end? The proposed experiment looks exceptionally simple. Has this experiment been conducted? If there were positive results, the fringe forums would be ablaze with excitement over the possibilities. I suspect that an experiment may have already been performed in the ten months since the paper was published, but due to the unpopularity of null results in scientific publishing, the results haven't made it very far. Don't know, but I agree that the experiment is simple and if it would be positive we should have heard about it.